I know it's a bit late for such time consuming cookies, but I thought I'd share this recipe anyway. Why not? 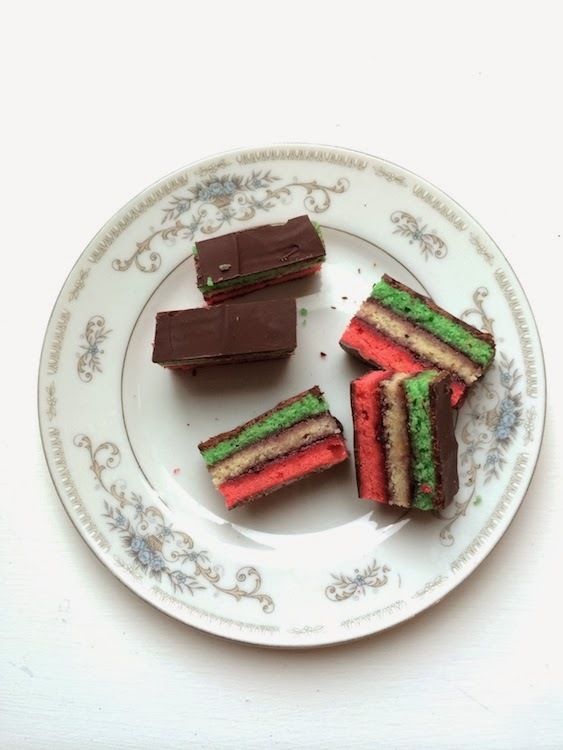 A while back JD and I made rainbow cookies from a recipe given to us by a friend. They came out perfect but it has since been lost and I foolishly didn't post it to the blog, just photos. What on earth was I thinking? So we did what any reasonable person missing a recipe with a craving would do, googled. We ended up choosing two very similar recipes and combined, then changed them. Manhattan grocery stores don't believe in eight ounce containers of almond paste. * We substituted marzipan for almond paste since we could not find a container with at least eight ounces in it. They are almost the same thing, the difference lies in sugar content. Marzipan has more sugar. In a large bowl, combine the marzipan and 3/4 cup and two tablespoons of sugar. It is recommended to use a mixer but we did this by hand. It took quite a while. Mix until it crumbles. Add the butter, pieces at a time, and mix until well combined. Beat in egg yolks, one at a time, until the mixture is smooth. In a separate bowl, sift two cups of flour and add salt. Add the sifted flour and salt to the first bowl and mix until combined. In another bowl, whisk the egg whites until foamy, then add the remaining two tablespoons of sugar. Whisk until firm peaks form. You may want to use a hand mixer. Fold one third of the egg white and sugar mixture into the batter, then carefully fold in the rest. The batter should be fluffy. Divide the batter evenly into three parts. Place the first, uncolored section on a greased pan. Separate the two remaining sections into different bowls and add food coloring, red to one, green to the other, and stir until blended. Add as little or as much food coloring until you achieve your desired shade. Transfer the batter to the remaining pans and spread it evenly using a spatula. Bake at 350 degrees for 8 to 10 minutes, or until the edges are just beginning to brown. * It is often recommended to also line the pans with parchment paper, but we were all out and therefore did not. As long as you've sufficiently greased the pan the world shouldn't end. Once the layers have completely cooled, spread an even layer of preserves over the entire first layer (green) to the edges. Carefully lift the second layer (plain) on top of the first and spread preserves to the edges and place the third layer on top. It doesn't matter if the layers crack or break during the assembly process, the sticky preserves will hold it all together. Cover the cake with plastic wrap or aluminum foil and place a cutting board and several heavier books on top. Let it sit for at least four hours or overnight. * It's recommended that you refrigerate it, but if you don't have the space, room temperature is just fine. * We used JD's old law school books and let it sit overnight at room temperature. Melt the chocolate in heatproof bowl above a pot of simmering water. Since we kept the cake at room temperature to compress, we popped it in the freezer for twenty minutes before we began, the stone cutting board too! Once melted, pour over the cake and spread evenly using a spatula. If the cake is cold the chocolate will solidify much quicker. We then placed the cake back in the freezer until the chocolate hardened. Once it was, we flipped it over onto the cold stone cutting board and spread chocolate over the other side. Once the chocolate has hardened, trim the edges and cut into even pieces. These cookies are time consuming, but they are worth it.